Thank you to everyone who has visited to see my Scrap-Mart Holiday Blog Hop post and left such sweet comments! To see that post, please scroll down or click HERE. You still have until midnight CST on Sunday, 12/5, for a chance to win some fabulous prizes.. Good Luck! Hello! Happy weekend! Sparkle Creations Rubber Stamps is sponsoring Sketches by Carly! You have 2 weeks to play along and one lucky player will win 2 not-yet-seen stamps.. Sparkle is generously donating Valentine's Oliver and Cupid Emily (they are uber-cute and will be released on 12/11!!). Carly and her mom, Kristine, have also played along this week. To see their fabulous creations and for more details (and the sketch), please visit Carly's blog here! 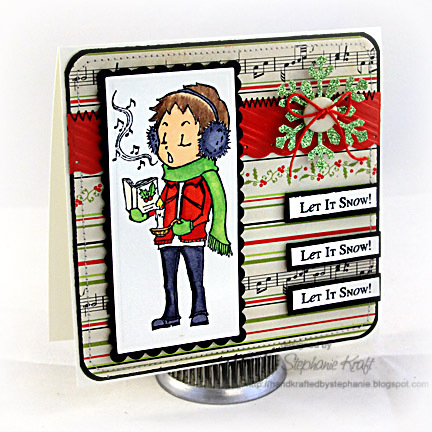 I used Caroling Josh for my card today.. when I first saw the sketch, he is what I pictured, so I ran with it. I paired him with some paper from The Girl's Paperie, Tinsel & Twig. Sentiment is from Winter Swirls (PTI).. I bet you can guess what song was stuck in my head as I was creating this! Accessories: Long Rectangle and Scalloped Long Rectangle Nestabilities (Spellbinders), Diamond Scallop border punch (EK Success), Snowflake punch, Twine (Martha Stewart), Candy Cane Stripe embossing folder (Provo Craft), Markers (Copic), Button (Papertrey Ink), Foam tape, Thread, Sewing machine. You have such great ideas! I love this! =) Super card!! Love this image and your DPs and sentiment--perfect! Thanks for playing along with us and for the shout out! =) Merry CHristmas! Always love to see what beautiful papers you are going to pair up with your sweet images. Lovely take on the sketch. This is just darling! I love the music paper! Super cute card Stephanie! Great job coloring the sweet image and I love the shimmery snowflake! Perfect Holiday card..Love the music BG with your caroling image.. The green sparkle snowflake is so pretty too...!! I love this sparkling creations and sketch work. http://www.facebook.com/pages/Viva-Magazine-Your-Premium-Womens-Natural-Health-Magazine/262734921452?ref=ts Im really lucky to visit your blog. Very simple and best post. The gift looks very colourfull and cute. Thanks for sharing!!! I just adore the creativeness in the green snowflake!